This is a new discovery of mine; there were no Adele songs on my most recent list of favorite 100 songs because I didn’t know any. Actually, I kind of doubt that Someone Like You will make the top 100 next time, either, but the other two probably will. There are others I like, but most of them are covers, like Cry Me a River and Save the Last Dance for Me. I don’t think that I Just Haven’t Met You Yet is a cover, and if it is, I’ve never heard of the original. My sisters, last I knew, totally do not agree with this one, but it’s probably my favorite of everyone on this list. I don’t actually know anything else by them, and I only know Knights of Cydonia because of Guitar Hero. Still, it’s a very cool song, and at one time, I knew it by heart. One could argue that this doesn’t really count as current or recent, but many of their hits were released during my lifetime. They’re a band about Doctor Who. That pretty much says it all. Unfortunately, there’s only one of their songs that I know very well. It is also worth noting that my very favorite song as of January 2012 is Stowaway, which comes from the Doctor Who soundtrack from 2007. Still, it’s true that a large portion of said list consisted of old stuff like Beatles songs and Irish folk songs. I am kind of fascinated by the idea that monsters and other supernatural scary stuff are metaphors for real-life scary things. For example, vampires stand for people, situations, or diseases that slowly take away your energy and strength. (Like the last week of classes before final exams, for example, or like financial aid paperwork) Ghost stories are pretty straightforward because they come from people’s fear of death and their uncertainty about what happens after death. The zombie apocalypse legend, obviously, comes from people’s fear that the world will be destroyed by mindless hordes. It is worth noting that zombies are actually fairly real compared to other imaginary monsters. Basically, a zombie is a person with a non-functioning mind and a functioning body. It almost goes without saying that the body is dead; I’m going to assume that if the mind is completely and permanently absent, the person is dead. Technically, a person who is sentient and alive but not actually thinking at the moment is acting like a zombie. I’m not just talking about being absent-minded. There are various diseases and parasite infections that can put a person in a very zombie-like condition. If you don’t believe me, google Creutzfeldt-Jacob disease, which is the human version of Mad Cow disease. Or the nodding disease, which is a problem in some parts of Africa. Or rabies. And while you’re at it, go ahead and google ‘fugu poison and datura stramonium’, because that involves actual zombies and it’s quite weird. Even aside from the zombie diseases mentioned above, a collective loss of intelligence is a real concern. I personally have a phobia of stupidity and live in fear that my IQ is dropping, and while that’s kind of a silly fear, it’s true that people can become stupider. That’s less of a problem for individual people than it is for humanity as a whole. It’s pretty undeniable that popular culture is being dumbed down in this generation. If you don’t believe me, compare any current popular novel with something written in the 1800s or early 1900s. Even if the old novel you’re looking at was a particularly bad one, it’s still going to have a richer vocabulary than anything written recently. Or you can watch a children’s TV show while you inevitably feel pity for the poor little kids who watch that stuff on a regular basis. Or you can just go to a public place like a grocery store or a bus station (places I have been recently) where you will quickly discover that people who are lacking in intellectual aptitude are not exactly abnormal. I know that IQ goes up over time and that IQ tests have to be constantly revised to maintain the mean and constant deviation, but IQ isn’t really a perfect indication of actual intelligence, which is much more abstract and difficult to measure. 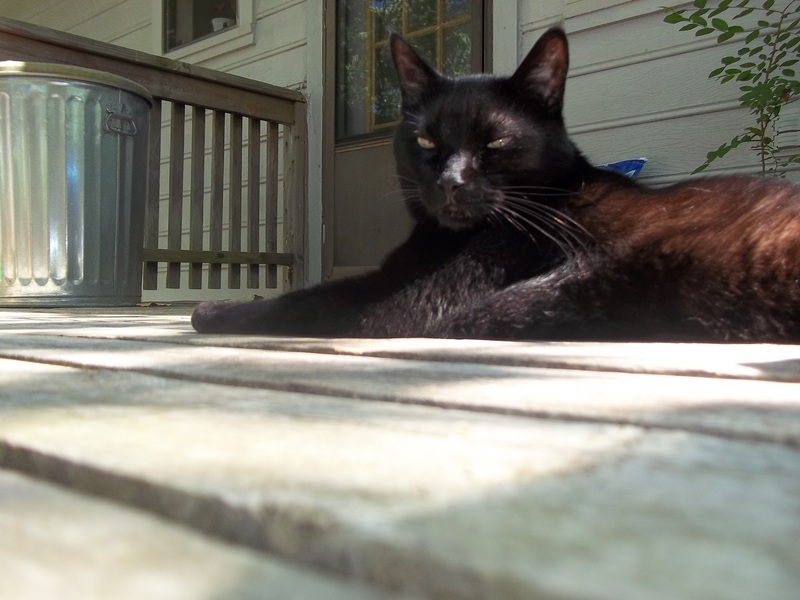 This morning, I gave my awesome cat Bo a cat treat, and then I gave my awesome cat Heidegger a cat treat. At least, that was the idea, but Bo pushed Heidegger’s face out of the way and snitched it from under her nose. I gave her another one, but she was still pretty angry about the situation. I can’t say I really blame her. A little later, I took Bo out on the deck. 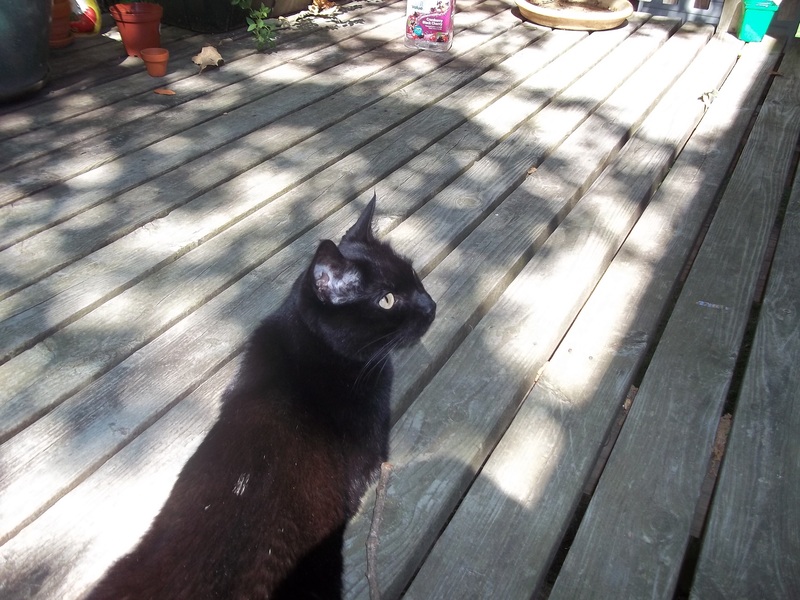 Bo loves being on the deck, and Heidegger doesn’t; she only likes the outdoors when there’s a window in between it and her. Here is a picture of Bo being happy on the deck. 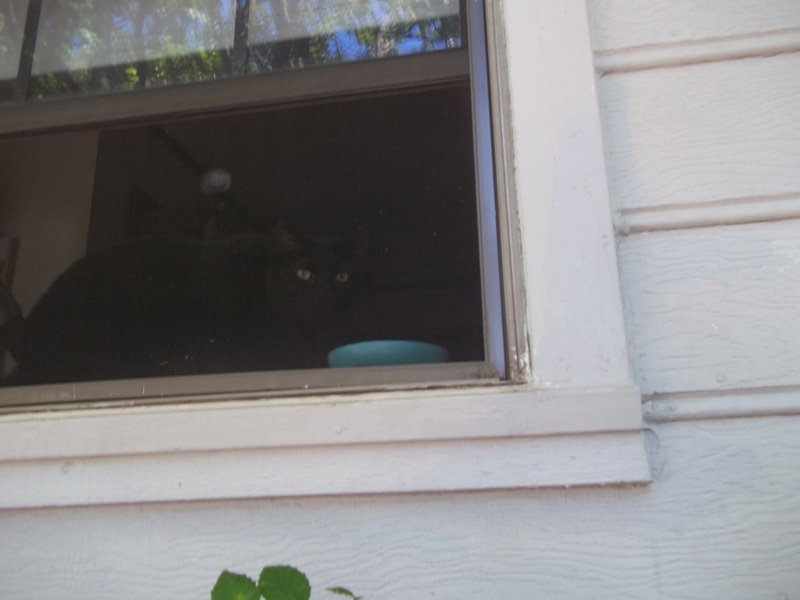 Out of anger and spite, Heidegger jumped up onto Bo’s windowsill in the kitchen and drank out of Bo’s water bowl. I told her that wasn’t a great idea, but she thought it was pretty funny. Here is a picture of Heidegger on Bo’s windowsill. 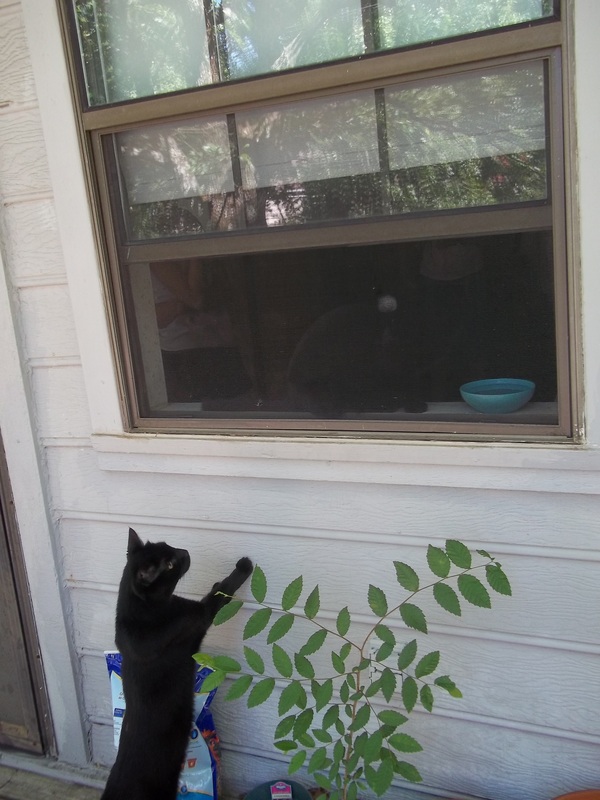 Here is Bo noticing that Heidegger is on his windowsill. I opened the door to let him back inside, but she quickly ran away from the ensuing wrath before he even got through the door, so he decided to stay out on the deck. Unfortunately, his good mood was already ruined. After that, he couldn’t take his eyes away from the window. It’s a little high for him to have a good view of the windowsill, so he tried jumping up onto it. There’s no window ledge on the outside, so he had to grab onto the screen with his claws and hang on to keep from falling. He did not enjoy being in that position, so I pried him off, for which he was quite grateful. There are now a couple new holes in the kitchen window screen. The moral of this story is that one should never give cat treats to a cat when there’s another cat in the room. I have often heard it said that the sounds made by a bat cannot be heard by human ears because they are so high pitched. I would like to make it quite clear that this is untrue. Not only are bats audible, but they are quite talkative little critters. I spent probably about two hours of this evening sitting outside to watch the bats emerge from the bat-house, and I can definitively say that I heard them chattering the entire time. I also recall having been able to hear bats in caves before, but in those cases, there usually were other people who couldn’t hear them; my hearing range apparently is greater than most people’s. I’m pretty sure that these bats in my family’s bat-house, though, would be audible to most people. It is a high pitched noise, but it’s only slightly higher than that of a birdcall. If anyone ever tries to tell you that people can’t hear bats, just know that they’re wrong. Also, bats are not blind. Just sayin’. Exactly one year from today, I’ll be graduating college. In a little bit less than one day from this moment, I’ll be watching the graduation of friends and former classmates who are a year ahead of me. Graduation feels a little weirder every year as the people who are graduating seem more and more like my peers. When I was a freshman, I didn’t know a lot of seniors, and the ones I did know seemed so much more experienced than me that I definitely saw them as my superiors. Last year, when I was a sophomore, I knew a lot more of the graduating seniors, but not nearly all of them. They were obviously closer to my age, but I still thought of them as being pretty far ahead of me. This year, though, there will be people graduating who have been in classes with me many times, have discussed assignments with me, and, in many cases, have asked for my help with their papers when I’m at work in the Writing Center. (I’m a peer tutor, which is most of the time a pretty awesome job, especially because it means I get to tell people that I’m a professional grammar Nazi) I think that the majority of the graduating class this year is people that I know personally, or at least that I’ve talked to a number of times and will recognize their names. The weirdest part is that for most of these people, this will be the last time I’ll see them. That isn’t quite as sad as it sounds, but it’s still a little bittersweet. It’s time for yet another holiday post. The holiday to which I am referring is not the first day of summer break, although that is incidentally also today. Technically, the first day of summer break isn’t actually a holiday; I mention this event merely because it’s kind of a big deal. Anyway, today’s holiday is Ascension Day, and to be honest, I almost forgot about it ahead of time. It’s a good thing I have a Lutheran calendar that reminds me when all of the church holidays are. 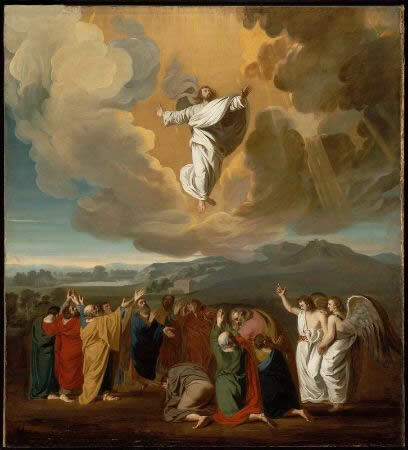 In honor of today’s holiday, here is an Ascension Day picture. I chose this one because Jesus is fully dressed in it, and I think it seems likely that Jesus generally wore clothes. It strikes me as being odd and a little sacrilegious that many artists, particularly those of the Renaissance era, like to portray Jesus as if His attitude towards clothes was similar to that of Captain Kirk. (In case anyone hasn’t noticed, Captain Kirk apparently has an aversion to wearing shirts) It is true that Jesus wasn’t fully dressed when He was crucified, (Matthew 27: 35) but the Ascension occurred forty days after the Resurrection, so Jesus probably would have found the time to get dressed at some point. Actually, it isn’t really important what Jesus was or wasn’t wearing at the time of the Ascension. If it did matter, the Bible would have been specific about it. Thus endeth my random speculations and comments about Jesus’ attire. And now I’m going to stick a couple bible verses at the end of this blog post so that isn’t random and pointless. Today is two very important holidays. The first one, of course, is Mother’s Day. Since I think I should write a blog post for every important holiday, I figured I should say something about Mother’s Day, but I wasn’t sure what. It wouldn’t make sense to just write something telling my mother Happy Mother’s Day because, as far as I know, she doesn’t read this blog. (In case I’m wrong about that, hi Mommy! Happy Mother’s Day!) I didn’t think it seemed right to say stuff about my mother without asking her ahead of time if that was okay. The only other kind of Mother’s Day post I could think of would be a really cliché and generic paragraph or two about how wonderful mothers are in general and how my mother is especially wonderfully mother-ish, but I didn’t want to write something cliché and generic. In case my sister is reading this, I would like to point out that there is in fact a reason why I chose to use the non-word mother-ish instead of the word motherly. The tone is completely different. Anyway, my dilemma about the ideal Mother’s Day post is solved by the fact that there is a second holiday today. This second and less well-known holiday is Lysander’s Birthday. 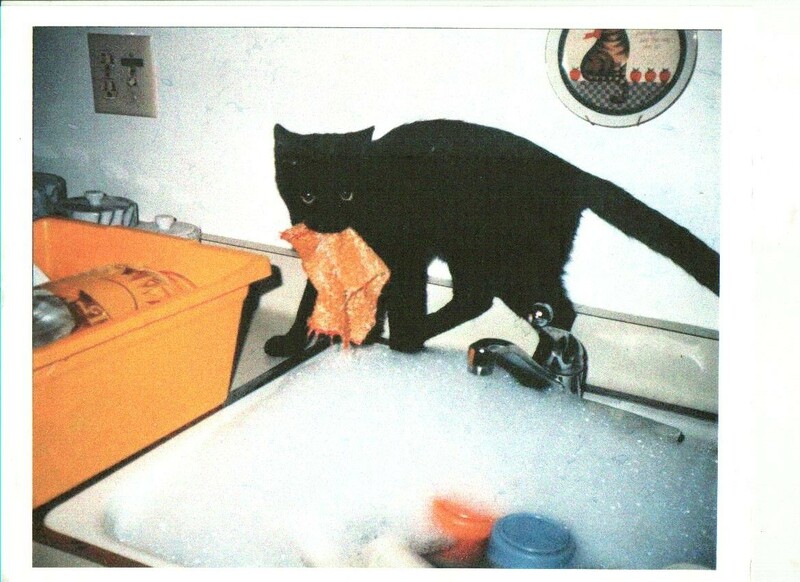 Lysander (1986-2004) was one of the cats who graced my family’s home with his presence for much of my childhood. He was also my adoptive third parent. There are no words to describe his awesomeness, but if you want to see a list of words that come close, get a thesaurus and look under ‘affectionate’, ‘loyal’ and the adjective form of ‘kind’. Here is Lysander’s baby picture.